Some farmers always get a good forage stand and some always fear seeding because of difficulty getting good stands. A good stand is crucial to profitability. If the stand is thin, it will never yield well and will be weedy. Additionally, if the stand is so poor that reseeding is necessary, the grower will have lost most or all of a growing season for forage production on that field. More that 90% of forage stand failures are due to one of three reasons: 1) low soil pH, 2) loose soil, or 3) seeding too deep. Each cause of stand failure is preventable by the farmer. We have known for over a hundred years that alfalfa needs a soil with a pH of 6.8 and other legumes need a pH of 6.0 to 6.3. However, many farmers do not apply lime either in adequate amounts or sufficiently far ahead of seeding to raise soil pH. Failure to raise soil pH to optimum levels results in poor germination and slowed seedling growth, which makes the seedlings more susceptible to disease and death. Lime should be applied 1 year prior to seeding to allow the soil pH to raise to optimum. The second major cause of stand failure is seeding into loose soil. Soil must be packed around the seed to make good seed to soil contact so that the seed can take up water from the soil. All of us have seen fields where the forage stand was better in the wheel tracks or the headlands–where the soil was packed more firmly around the seed. The old, but good, recommendation has been that if you stand on the field and your shoe sinks more that 1/4 inch into the soil, the soil is too loose for seeding. Some soils need to be fall plowed to allow settling to occur before a spring seeding. Chiseled soils may need less time to settle but still require disking to level and pack the soil surface prior to seeding. 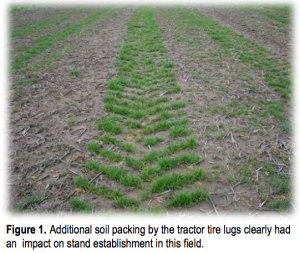 Fields seeded no-till will generally have firm soil, though some disking may be necessary in these systems simply to smooth the field for future hay making. Spike tooth harrows or drags will level the field and break up clods but they are bad for seeding because they loosen soil rather than pack it. 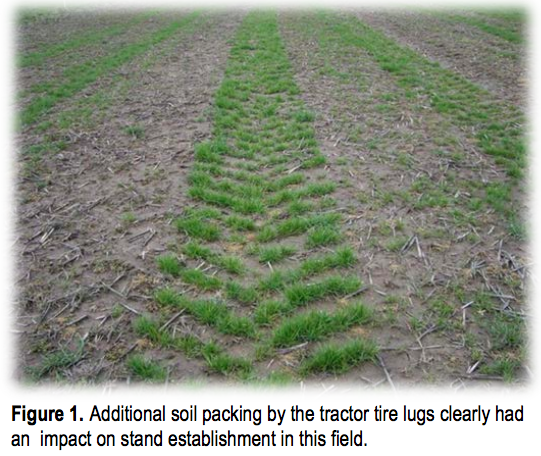 A Brillion seeder has been successful on tilled fields because it has two corrugated packing rolls to pack the soil. A drill can do as well if it has press wheels that are properly adjusted. Some farmers have attached a corrugated roller behind the drill to further pack the soil. Note that a corrugated roller is much more effective in getting a stand than a smooth roller because the latter rides up over clods, stones, and ridges whereas the former packs more consistently across the contour of the field. The third major reason for stand failure is seeding too deep with a drill. Legume seed should be placed 1/4 to 1/2 inch deep in most soils (3/4 inch depth in sandy soils). 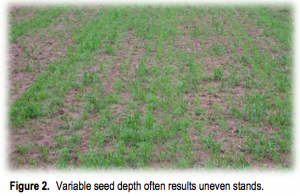 Placing seed deeper may delay or reduce emergence and result in poor stands. Poor seed placement is often visible in new seeding as rows or parts of rows germinate and emerge well while adjacent rows have a poor stand as shown in Figure 2. One good test to use when seeding with a drill is to look for seeds on the soil surface after seeding. If the seed is properly placed at 1/4 inch depth, some seed will end up on the soil surface. One should find 8 to 10 seeds per square foot on the soil surface. If the number is less, you are likely placing the rest of the seed too deep. In summary, forage seedings can have a high success rate if the grower seeds at proper soil pH, depth, and packs the soil well.